My grandfather first made his reappearance in 2010, startling his daughters by walking out of the background of a scene in a television documentary, over two decades after his death. 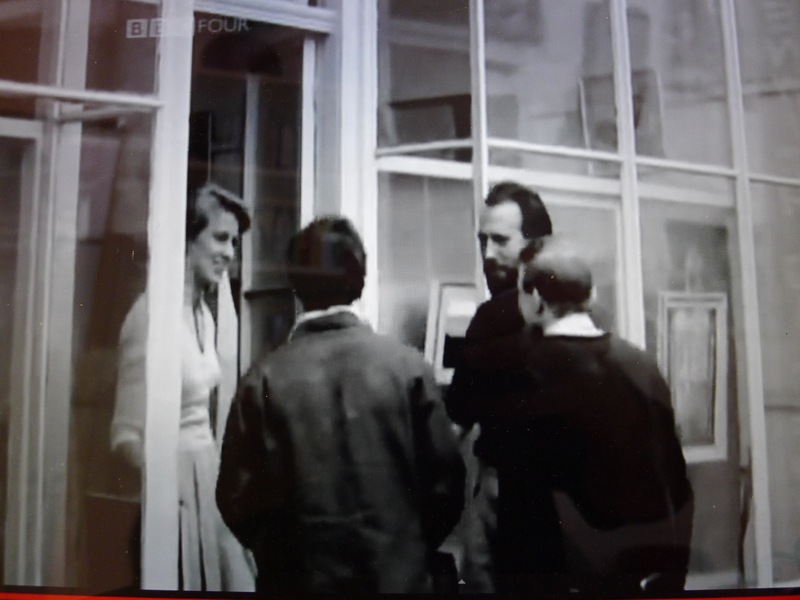 His three second resurrection, in black and white on the small screen, rolled the boulder away from a great cave mouth of memory out of which he appeared determined to walk as well, half a century after he vanished from the vibrant heart of the British art scene. Bruce Taylor and his works’ reappearances were synchronised: that same year French curator Gerard Mermoz was browsing a boot fair in north Catalonia when he was stopped in his tracks by a distinctive painting and ceramic plate: “They bore”, he later told me, “the stamp of both English and Continental Modernism and I wondered how works of this quality could end up at a ‘brocante'”. Curiosity piqued, Gerard started asking questions about the mystery artist. They led him to a small village deep in the Pyrenees, the dusty catalogues of old galleries, a treasure trove of broken dreams and a compelling oeuvre that he hopes to “write back into the history books”. Four years later, his digging had also led him to my mother’s childhood home in that crucible of British Modernism, St. Ives; the fortunes of which the BBC documentary The Art of Cornwall had documented and in which my grandfather had appeared so briefly in a doorway, beckoning. 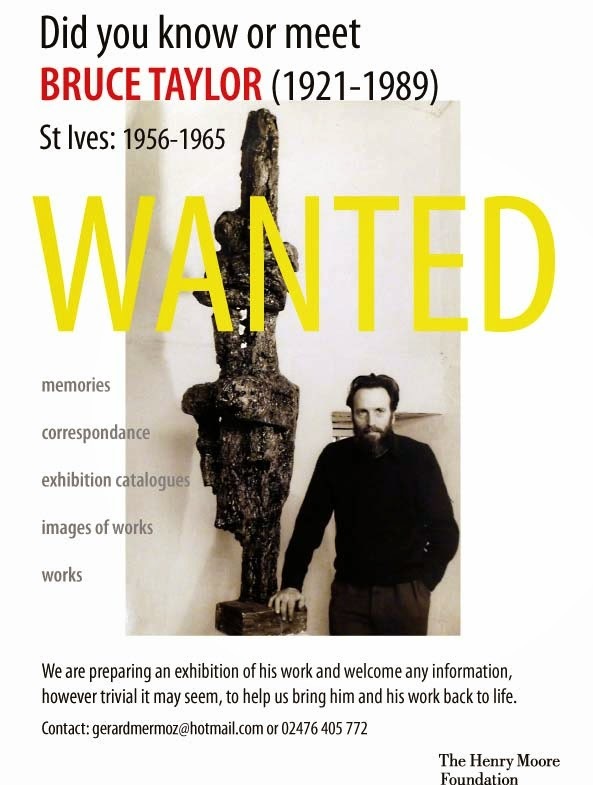 Perhaps more wistfully than in genuine hope and reinvigorated by a grant from the Henry Moore Foundation to sustain his efforts, Gerard left a “wanted” poster at the house; hardly expecting that just weeks later, coincidentally and for the first time in over 40 years, my mother would be taking a trip down memory lane and revisiting the moors of Cornwall on which the house nestled, picking up the poster with amazement as if it were a missive from beyond the grave, then picking up the phone. As Gerard would learn, Bruce Taylor and my grandmother Jennifer moved to St. Ives in 1956, where they initially lived in a caravan in a walled garden; a watering can hung from a tree with a string tied to its spout serving as the shower. He flung himself into the creative life of the town; the following year being elected chairman of the Penwith Society of Arts – founded by Barbara Hepworth and Ben Nicholson – during a fecund creative period that saw him exhibiting alongside Henry Moore. My grandfather counted Alan Davie as a close friend and as an accomplished potter, Bernard Leach as a mentor. Yet while his sculpture would go on to be exhibited at the New York’s Museum of Modern Art and in a number of successful solo shows including at Halima Nalecz’s Drian Gallery, by 1969 he had vanished from the art world in a disappearance so complete it took a chance find at a Catalan boot fair and a sharp curatorial eye to notice the few footnotes and footprints he had left behind. As Gerard’s encounter with my mother last year would reveal, by 1969 Bruce had decided to move to the south of France, where he bought a derelict farmhouse and set up a pottery, hoping that it would generate enough income for him to be able to continue to work on his painting and sculpture, far from the madding and maddening St. Ives art crowd. It never did and the sparkle of the lively artists’ colony of which he became a figurehead fizzled out as his own complex personal life crashed and burned, but he stayed in the area until he died 20 years later; the mountains of the Pyrenees rising tall around him and sculpture mounted like an apotropaic at the door. Mas Fortou, Pyrenees. Late 1970s. 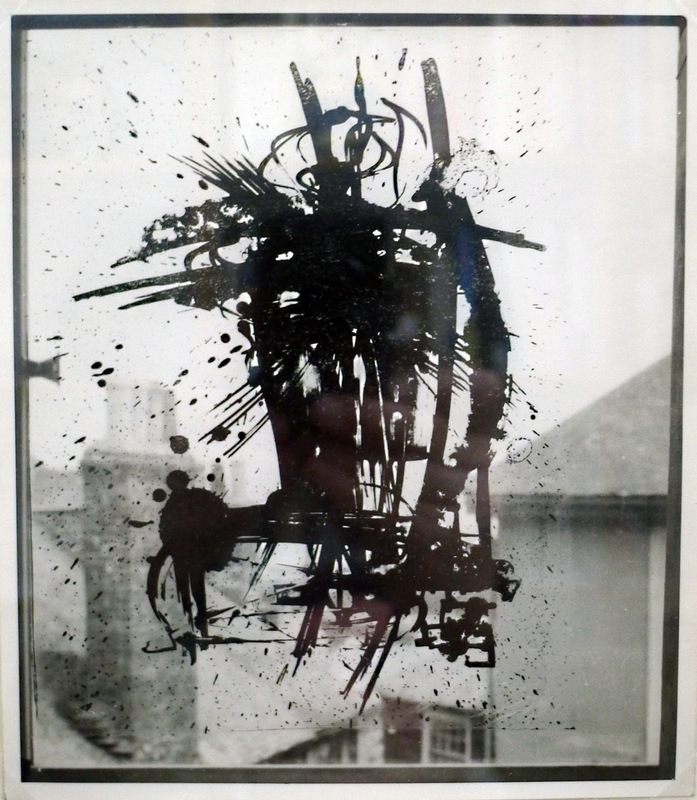 Dubbed one of the “earliest serious sculptors” to work in the medium of welded steel, much of his art remains missing or scattered across private collections – one piece by the avowed agnostic has been mistaken for a crucifix and now hangs sideways in a small French church. Others have tumbled dusty out of family attics or generously been made available by private collectors and Gerard has assiduously gathered enough together for an exhibition, currently in search of the space it deserves. Bruce Taylor. 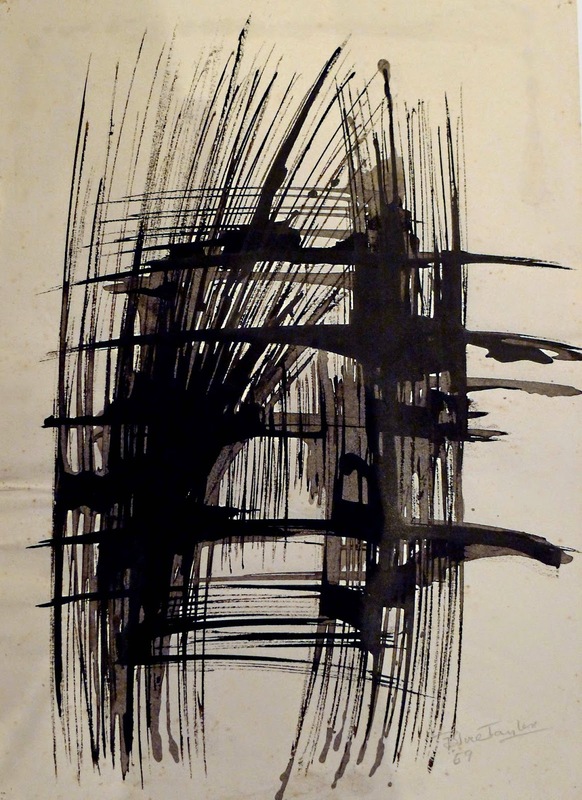 Title unknown, 1957. One of the paintings unearthed in my aunt’s attic. 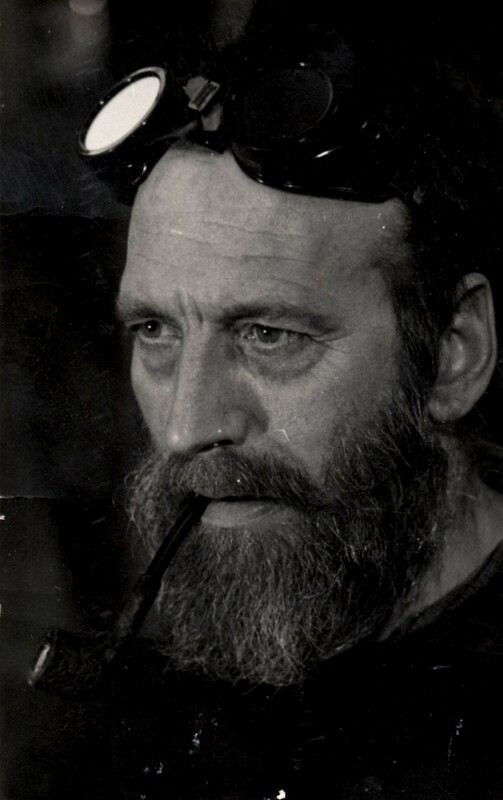 An aside: it strikes me as impossible to talk about the art of this jazz-loving, whisky-drinking, charismatic old idealist who had worked briefly as an entomologist before studying at the Bath Academy of Art at Corsham as a mature student – without talking about the war; a recurring theme in his work. Yet it is also currently impossible to talk about his experiences in the war with any degree of authority or authenticity. He would have been just 18 when the Second World War started, and served (I’m unsure in which division) my aunt recalls, as a sniper. While the anecdotes he shared with family about his experiences were often either comical or faintly surreal (going in search of a vet, after a cow belonging to a farmer he was bunkered down with choked on a turnip; encountering a German family that had fled the war to live in a tree house deep in the Black Forest) both his daughters recall him speaking about the first sight of a concentration camp he had helped liberate. I can only speculate that this may have been Bergen-Belsen, reached by Britain’s 11th Armoured Division in April 1945 and in which living skeletons walked among 13,000 unburied corpses in a scene of unparalleled horror. It seems worthy of mention as because of the very few aphorisms left that inform his work, his repeated discussion of the tension betwixt fight and flight, attack and defend is one. (He had, my mother recalls, as a pacifist initially intended to register as a conscientious objector). With titles such as “warhead”; “buckler”; “sentinel” and “warrior” a significant portion of his extant work appears to hearken to his experience as a soldier. A spearhead juts out of a buckler that has been riven by the offensive projectile driven outward through its boss; a defensive manoeuvre rendered ugly by the force with which it is enacted and one that makes a mockery of the smooth patina of the shield, the calm of the pond’s surface. Careful, it says to me, lest you become what you combat. 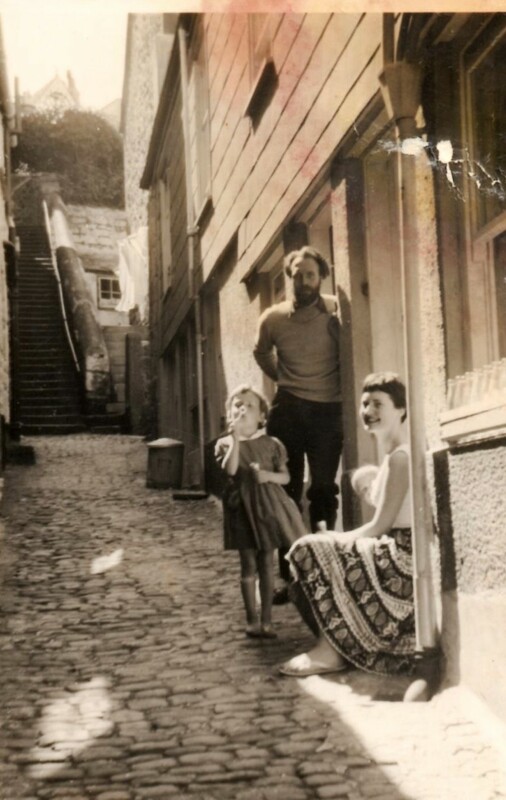 Bruce, his second wife Jennifer and their two daughters in St. Ives, circa approximate 1957. And yet I will leave the art criticism to the professionals. And whether Bruce’s art is wine or vinegar to them, I’m excited to see if more works to emerge and to see those that have be found exhibited. 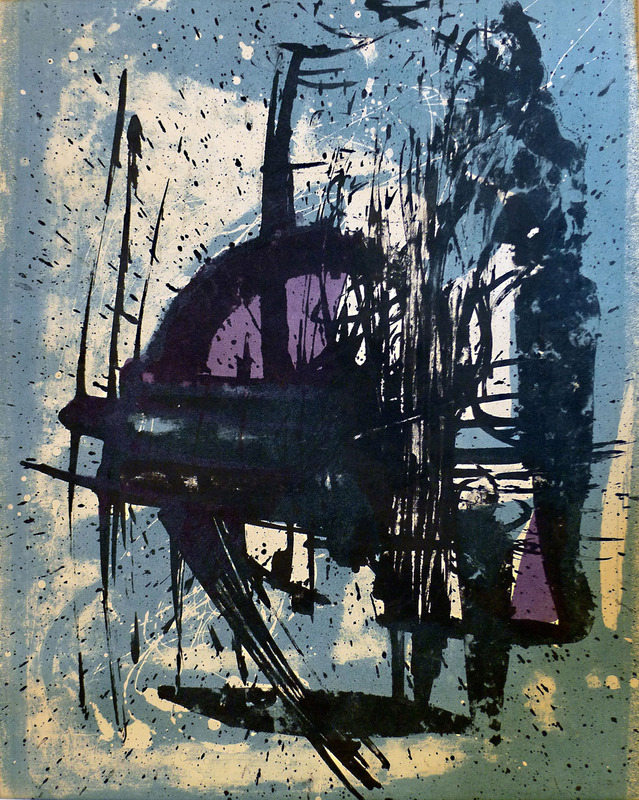 Interestingly, many of the pieces photographed at his studio in the south of France lack titles, while the lists of titles in catalogues from his exhibitions lack illustrations. The exhibition may, as a result, be structured as a puzzle in which visitors are invited to link works, titles, photographs of works, aphorisms, etc. Gerard, meanwhile, is looking for both more work and a suitable home for the exhibition, that could take the form of a cabinet’ size exhibition, presenting a small selection of works representative of his oeuvre, to a larger exhibition (requiring one medium size room) that would present my grandfather’s work more ambitiously in the context of and in dialogue with relevant examples of European art. The works available range from small pieces suitable for display in small self-standing display cases to larger wall pieces and works on paper, and a self-standing welded steel piece requiring a plinth. 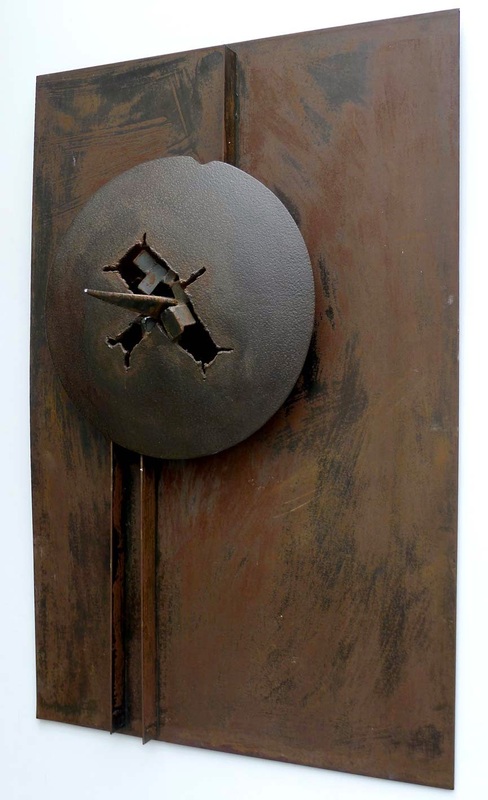 A medium-size room would enable a visual dialogue/polylogue to be set up between Taylor and some of his contemporaries, to explore his multi-displinary approach to art: from drawing, painting, ceramics, and print-making to sculpture in welded steel and bronze. 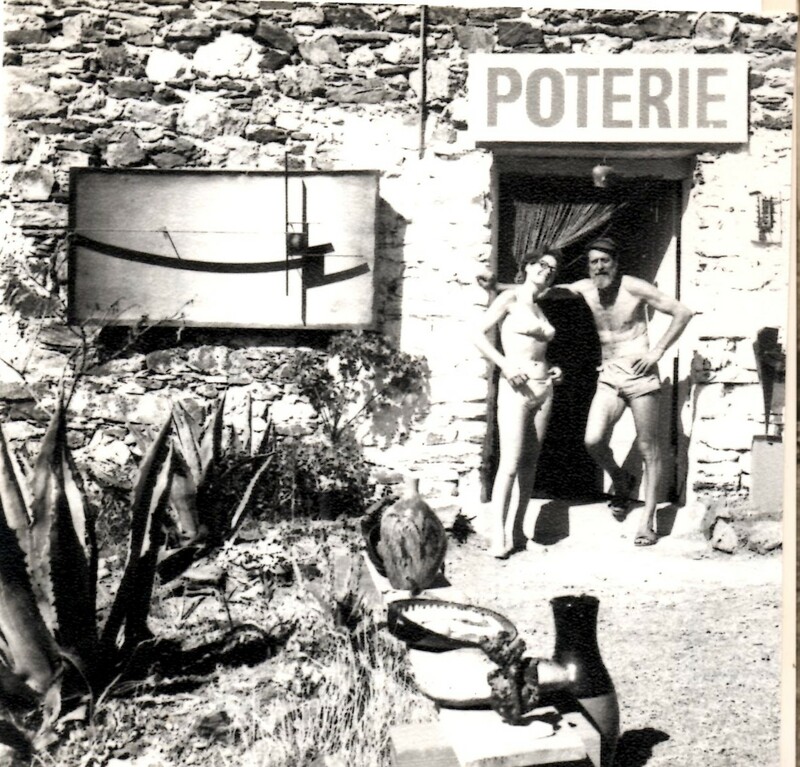 Whichever institution does end up hosting the exhibition, it will be bringing to light by an artist in many ways central to the St. Ives school, yet almost entirely unknown until a curator happened to be browsing the right boot fair in a small Catalan village. Are you interested in hosting it? Get in touch! I would also love to hear from anyone who remembers anything further about my grandfather, or who has work they would loan Gerard for the exhibition. Gerard’s blog, with considerably greater detail about the works, their history and their place in the scene from which they emerged, is here. 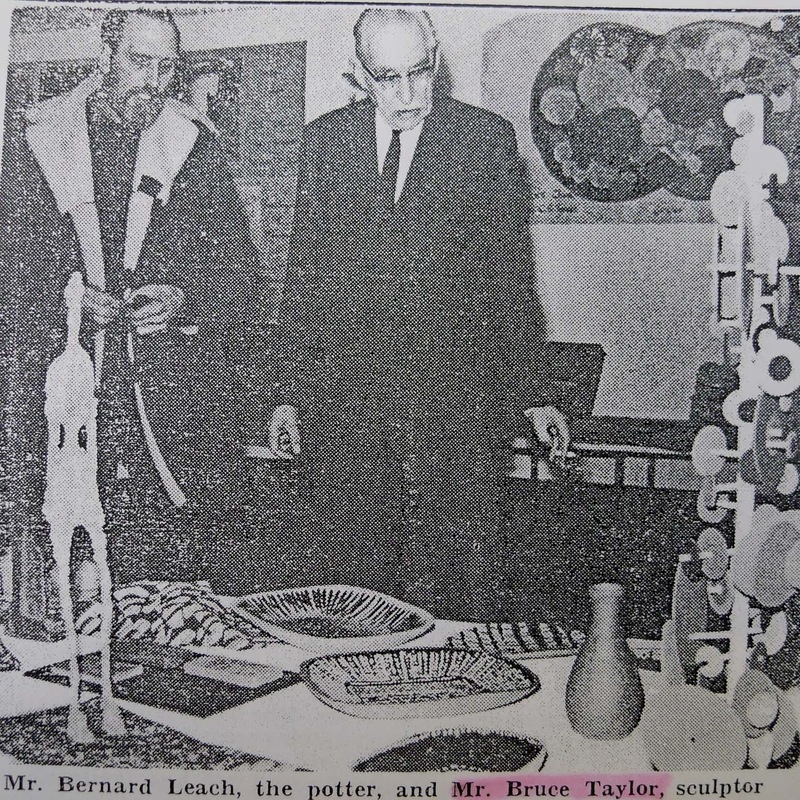 With Bernard Leach, opening an exhibition in St. Ives in the late 1950s. 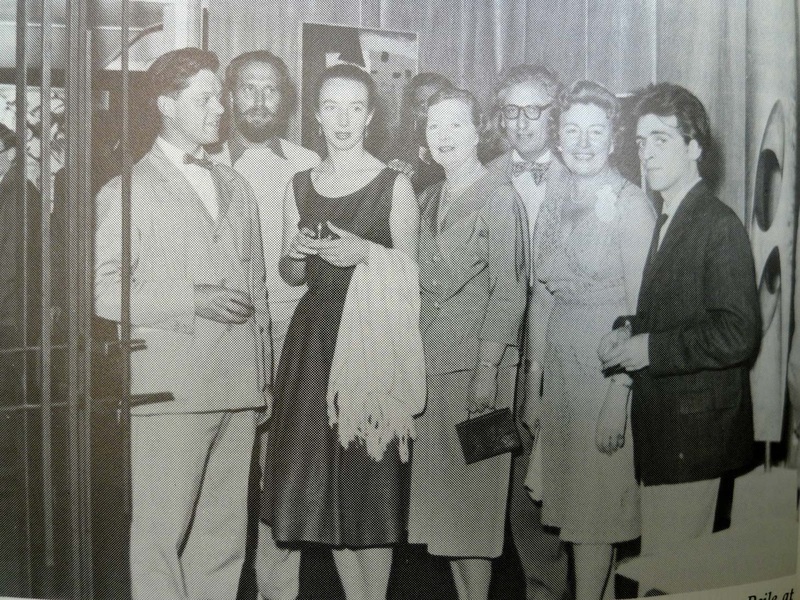 At the Drian Gallery, 30 June 1958, (2nd left) with, from left to right: Roger Leigh, Gwen Leitch, Misomé Peile, Denis Mitchell, Halima Nalecz and Brian Wall. Indian ink on paper. Signed ‘Bruce Taylor’, dated 1969.